Alex Rodriguez tested positive for a banned stimulant in 2006, The New York Times reported Monday, an accusation denied by a representative of the legal team for the Yankees' third baseman. Baseball's joint drug agreement specifies the discipline for a first positive test for a banned stimulant is six additional unannounced drug tests over the year following the violation. A second stimulant violation would result in a 25-game suspension. Rodriguez's legal team accused MLB of leaking the allegation of a positive test, using a statement and making a filing to arbitrator Fredric Horowitz. Lanny Davis, a former Clinton administration official working for Rodriguez's legal team, denied the player tested positive, the Times said. James McCarroll, a lawyer for the three-time AL MVP, did not address whether Rodriguez had a positive test, only that he was not banned. "Alex Rodriguez was never suspended for use of stimulants or any violation of the MLB drug program," McCarroll said in a statement. "The fact that MLB has resorted to leaking federally protected medical information about a player speaks volumes of the weakness of their case against Alex — and their desperation to secure a win in the arbitration, at all costs." "We were not the source for this story," MLB said in a statement. "We honor our joint drug program and never publicly disclose player test results until it's publicly announced." In a statement Monday night, Davis called for a government probe into MLB's methods. MLB has admitted paying for documents and Rodriguez's lawyers have claimed baseball's representatives have intimidated witnesses. "U.S. authorities should initiate an investigation as to whether any federal crimes have been committed by MLB investigators as well as those in the Commissioner's office who may have been complicit in this misconduct," Davis said. Rodriguez was suspended for 211 games by Major League Baseball on Aug. 5 under baseball's drug agreement for his alleged "use and possession of numerous forms of prohibited performance-enhancing substances, including testosterone and human growth hormone, over the course of multiple years." He also was penalized under the labor contract for "a course of conduct intended to obstruct and frustrate the office of the commissioner's investigation." The three-time AL MVP was allowed to keep playing until the arbitrator decides a grievance filed by the players' association to overturn the penalty. Horowitz has presided over eight days of hearings, which are scheduled to resume Nov. 18. "Alex has abided by the confidentiality rules of the arbitration process. MLB has not," McCarroll said. "In response to MLB's incessant leaks, Alex recently has even gone so far as to offer that the proceeding be opened to the media, so as to even the playing field — an offer which MLB promptly rejected, as they prefer to continue their one-sided flow of leaks, rather than having the weakness of their case exposed publicly by full and fair coverage. Every new step MLB takes wreaks of desperation, in its obsessive effort to bring Alex down." MLB and the union agreed in 2005 to ban many stimulants. The paper said it wasn't clear whether a failed stimulant test was introduced by MLB as evidence in the grievance. Rodriguez said when he arrived at spring training in 2008 that "last year, I got tested 9 to 10 times. ... We have a very, very strict policy, and I think the game is making tremendous strides." That would be an unusually high number of random checks but would be in line with a player subjected to additional tests resulting from an amphetamine violation. 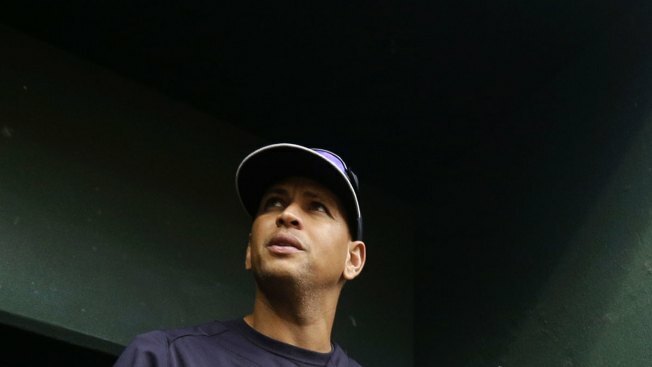 Later in the day, A-Rod said his comments were an "exaggeration to make a point." Sports Illustrated reported in 2009 that Rodriguez tested positive for steroids during MLB's anonymous survey in 2003, and A-Rod said two days later he used banned substances while playing with the Texas Rangers from 2001-03.